Bed bugs prevention pest control techniques should be a primary concern of every individual. According to statistics, treatment for bed bugs is much more costly and time consuming than the prevention of an infestation that has developed. According to health science news, bed bug infestations have increased and these troublesome pests are invading cities, homes, and other types of structures in immense proportions. Based on information derived from highly-respected entomologist and highly-educated expert in bed bugs, Jeff White, this annoying and potentially dangerous pest is not going to be eliminated at any point in the near future. Additionally, it has been estimated that, once this pest invades your home, it could cost approximately $1,200 to completely remove the bugs. In order to effectively eliminate the potential for incurring this expense, you should simply learn how to prevent the infestation from occurring. In this guide, you will learn the most productive bed bugs pest control prevention techniques. According to statistics, 99.6% of all the pest control companies in the United States have encountered an infestation of bed bugs within the past twelve months. The most common location for an infestation is the residential setting. Examples include single-family homes, apartments, condominiums, college dorms, and nursing homes. Treating these troublesome pests is considered to be more difficult than treating any other type of pest, including cockroaches and termites. 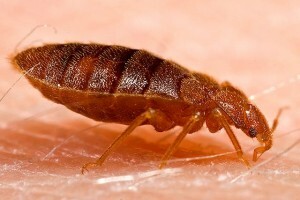 One out of every five people in the United States has either directly experienced a bed bug infestation, or knows of someone who has at either their home, or another location, such as a hotel room. Bed bugs have the unique ability of laying anywhere from one egg to five eggs in a twenty-four hour period. Most lay in excess of 500 during their lifetime. These creatures are highly resilient. They may survive for many months without a food source and survive during the most extreme temperatures – from freezing to excess of 120°F. These pests are found in all of the states and have the ability to consume up to seven times of their own weight when consuming blood. This is equivalent to the average man consuming 120 gallons of a type of liquid. Now that you are a bit familiar with these pests and basic statistics surrounding their characteristics and environment, it is time to become familiar with the most common bed bugs pest control prevention techniques. Learn how to identify the signs of an infestation and review your home for traces of the pests. Regular inspections are highly important in combatting an infestation before it really gets started. One of the most common bed bugs pest control prevention techniques is to ensure that mattress covers are used on each bed within the home, and furniture covers are used throughout the home. Second-hand items should not be brought into a home, unless a thorough inspection for bed bugs has been conducted and it has been established that the item or items are free from an infestation. Many infestations have been found in homes that have an excessive amount of clutter. In order to eliminate the possibility of a bed bug infestation, unnecessary clutter should be removed from in and around the home. Pet items, such as bedding, clothing, and toys, should be laundered in the hottest possible temperature settings within both the washer and dryer. If an item cannot be placed safely in a washing machine, simply place it in a dryer on high heat for anywhere from ten to twenty minutes. Cover the pillows on each bed in the home with a pillowcase encasement. Schedule thorough cleanings of your house each week. You should ensure that you wash all laundry in the hottest temperatures, you vacuum all appropriate regions of the home, dust regularly and completely, and eliminate all other forms of debris on a regular basis. If you have floors in your home that are not considered to be heat-sensitive, you should consider purchasing and utilizing a steam mop. These products emit such a high level of heat during cleaning that they have the capability to kill bed bugs immediately. Store items that cannot be washed and are not in use, such as toys, electronics, books, and breakables, in plastic bags that may be sealed. Caulk the moldings and the joints within the home with sealants to eliminate potential hiding spots for bed bugs. Seal openings in and around pipes and other objects that are designed to come through the flooring and the walls to assist in keeping bed bugs from entering into the home from the outdoors. Wash all surfaces in the home with a sponge, hot water, and a mild detergent. Utilize insecticides that are designed to treat and/or prevent a bed bug infestation. There are many bed bugs prevention pest control techniques that may be used to reduce the possibility for an infestation to occur. Anyone, in any location, has the potential to experience a bed bug infestation. The treatment for bed bugs is not only time consuming, it also has the ability to consume what available funds you have. Treating an infestation is a troublesome, expensive endeavor. In order to prevent the challenges and the expense associated with the task, simply take the bed bugs pest control prevention steps outlined in this pest control guide and apply them. By doing so, the chances that you will suffer from an infestation will be reduced dramatically.